This request of my husband usually has me quite giddy as I know we are about to entertain a group of friends for the evening. And we love to host our friends and family at our home. Like most of you, we have our “every day” dishes that we use for all of our casual meals. They know their role in our home. We keep them in the typical location within our kitchen cabinetry that one would expect. However, when we entertain, we immediately march straight over to the special cabinet where our nice dinnerware is stored. That’s not to say these pieces are only fitting for special occasions. Which is why I choose pieces that easily transition from a casual dinner with family to the most elaborate of celebrations. By the way, truth be told, I usually set the table myself. I enjoy doing so because it feels like decorating to me. 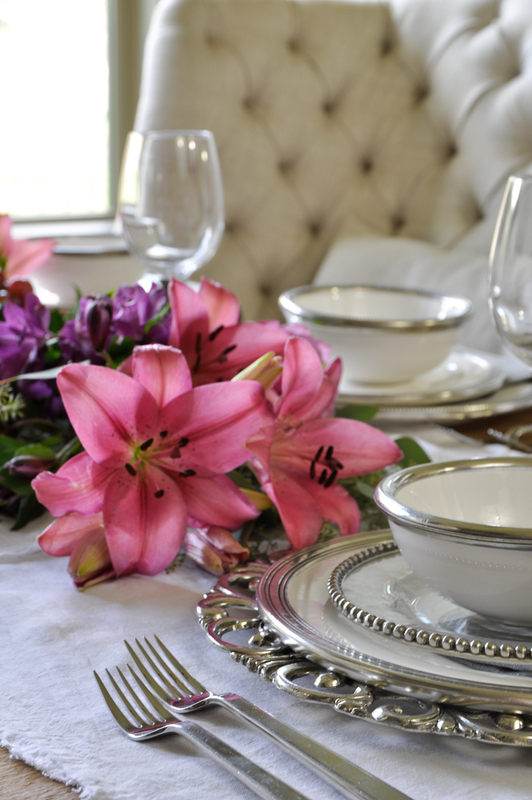 I am drawn to timeless designs which I know will compliment a variety of decor themes. As a result, the beauty of Arte Italica found its way into my home. 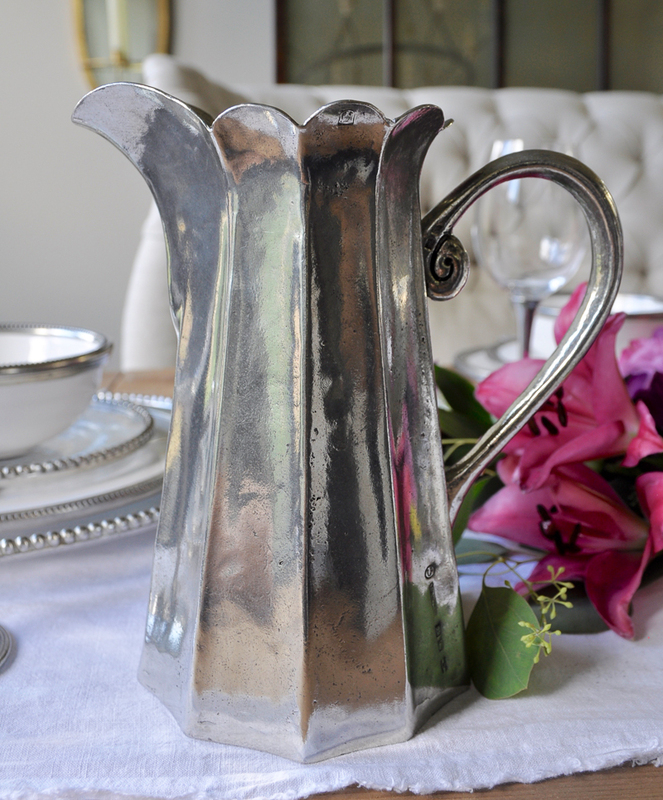 Their dinnerware mixes the finest Italian pewter with glass and ceramics. You can find various styles to select from. 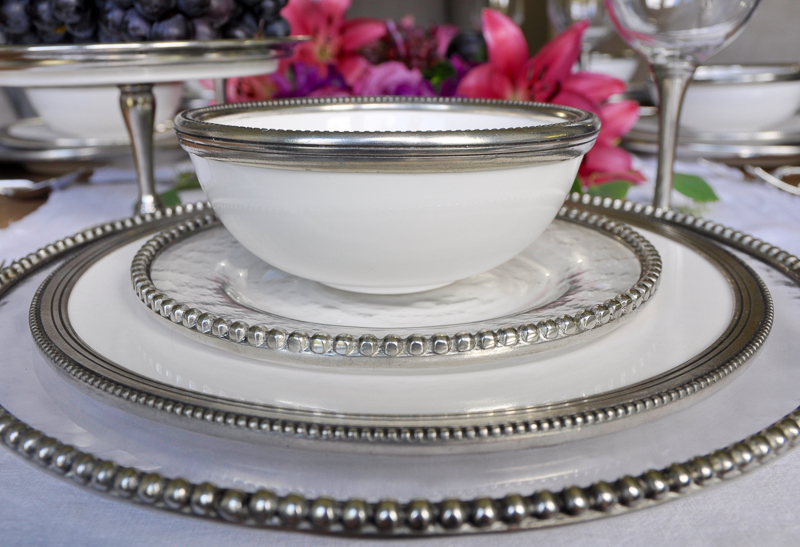 Today, I will be highlighting our pieces from the Perlina, Tesoro, and Tuscan collections. Also, please do not miss the very special offer at the bottom of this post! 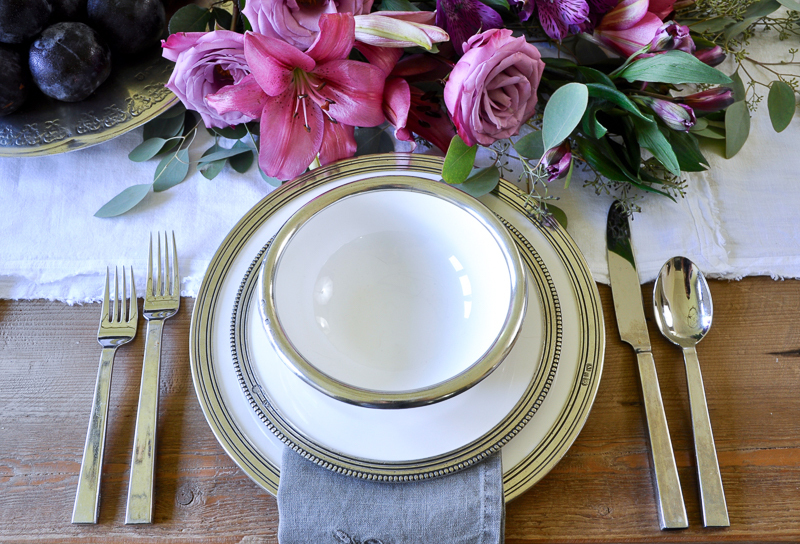 When building your dinnerware pieces, you do not have to choose from only one collection. Therefore, I love to mix and match from various collections and styles. 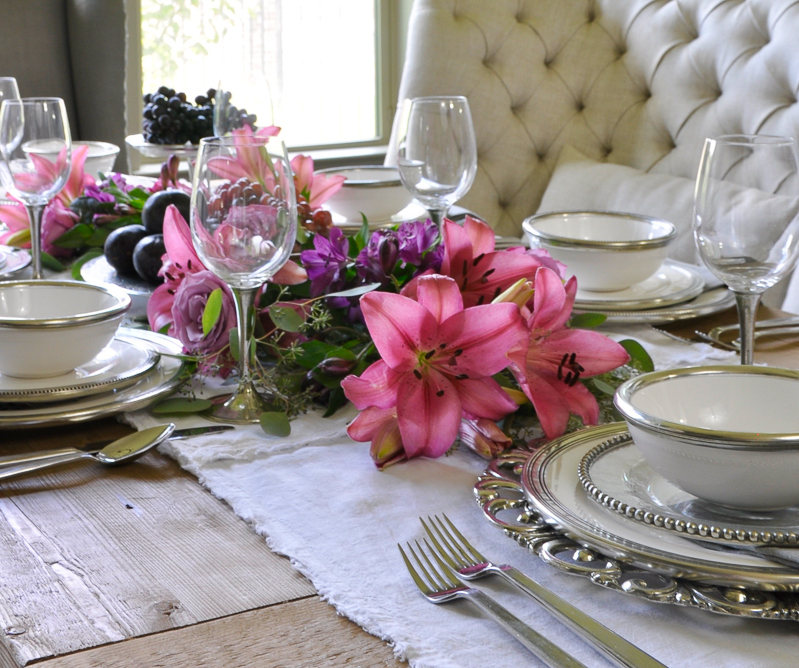 But, there are still guidelines to follow when setting a table. I like to talk about this process from “left to right” as you are visually seeing the place setting from above. If you were to hold each of your hands out in front of yourself and brought your index fingers to your thumbs and formed an “O” with each hand, you will see a “b” formed with your left hand, while a “d” is formed with the right. 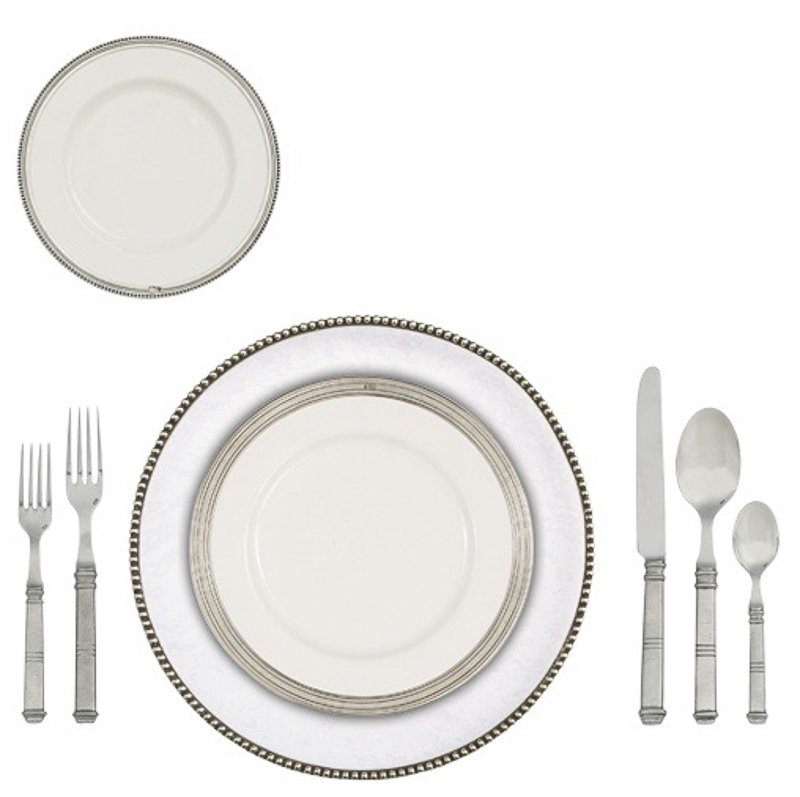 As a result, hopefully this will help you remember that the bread plate is to be placed to the left while the drinking glass is to be placed on the right hand side of each place setting. Additionally, you can pin the image below for easy access. You can also visit Arte Italica’s Style Your Table tool and preview different pieces prior to adding them to your collection. Now that we’ve covered the basics of placement, let’s get a little more creative. I don’t have a full set of any one style of dinnerware, but I can still put together a beautiful table and, in my opinion, an even more interesting table by mixing and matching. You can find links to individual Arte Italica pieces plus other dining room sources at the bottom of this post. When you decide to make a purchase such as this, I recommend starting with the dinner plate. 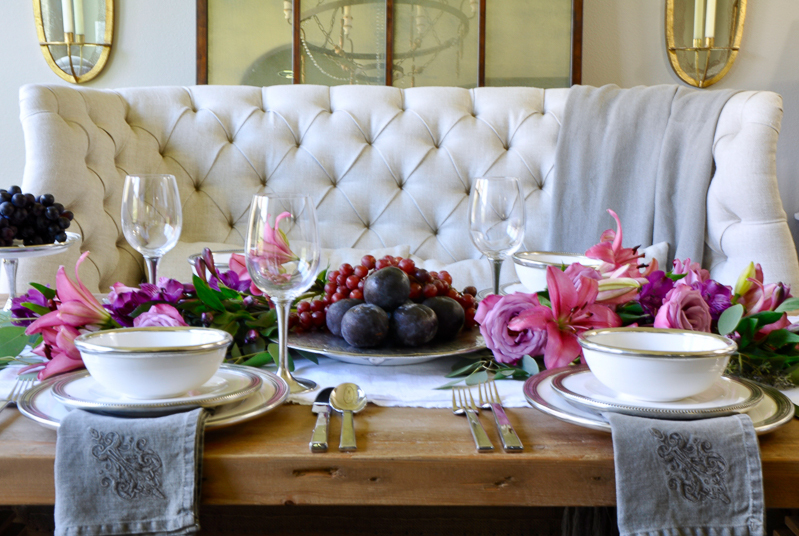 As a matter of fact, you could just buy amazingly beautiful dinner plates and host an incredible party. Even if you started with only two, what a lovely way to enjoy a meal with your significant other or dear friend. Once you have your dinner plates you will want to add salad plates. A simple rule of thumb here is to add the pieces that you will use the most and continue on to those that would be used a lesser amount. On a personal note, we only have two chargers as we are just beginning our charger collection. This is perfect as I can place one at each end of the table. They are of different collections and I love this about them. In fact, I do not own a full set of anything. 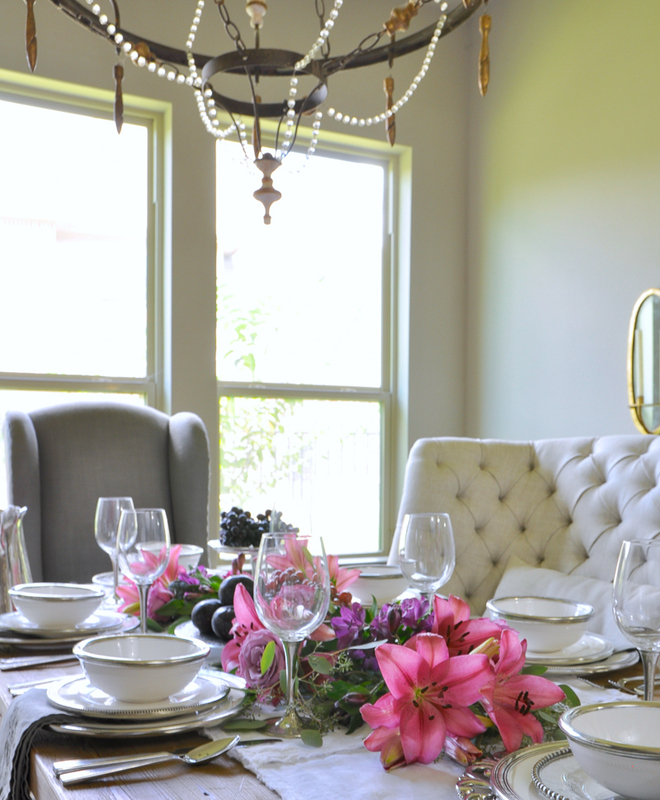 The eclectic nature of adding pieces one at a time is so compelling that I couldn’t imagine doing it any other way. 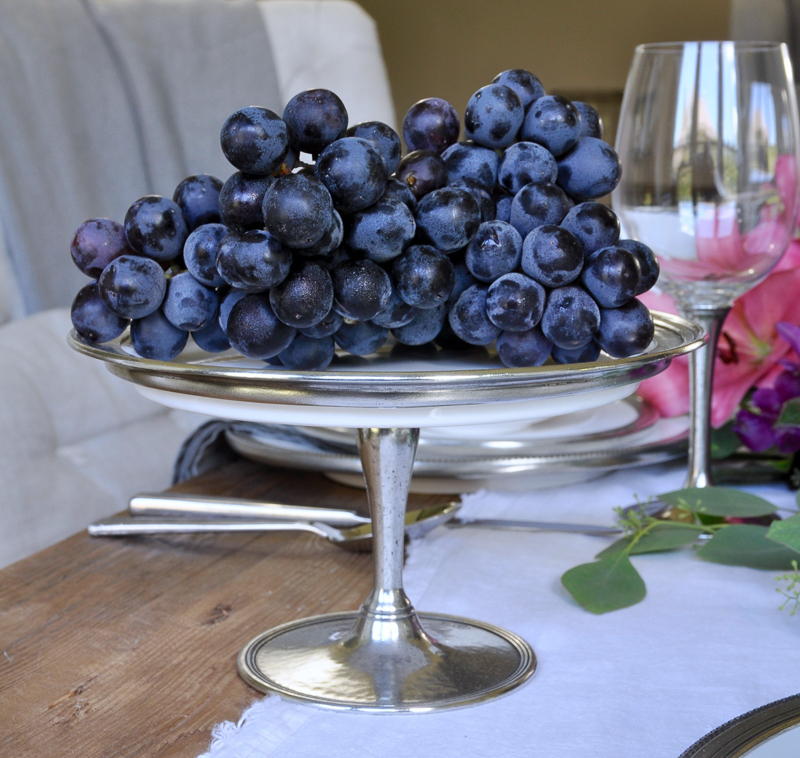 These pewter stemmed wine glasses add the finishing touch. 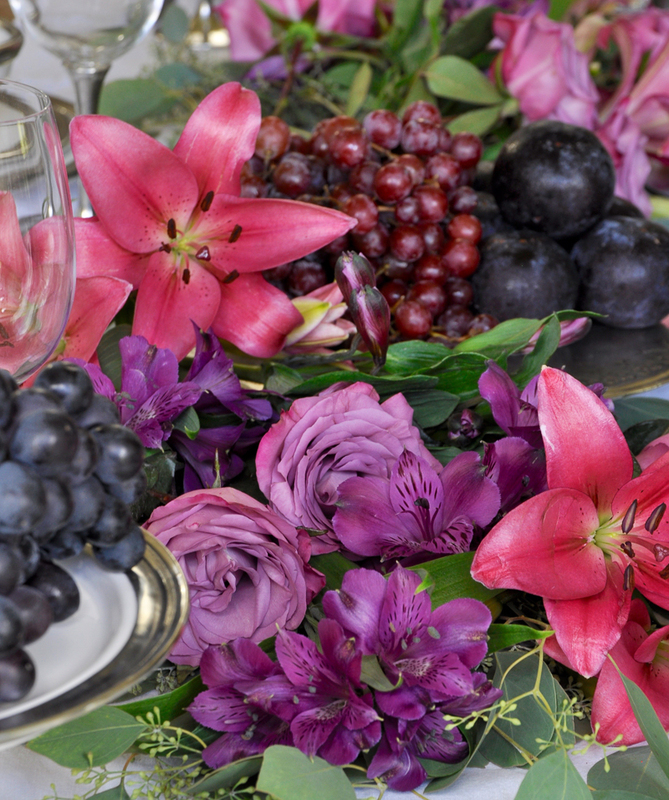 Now, let’s discuss centerpieces which are a must to offer balance for your table. 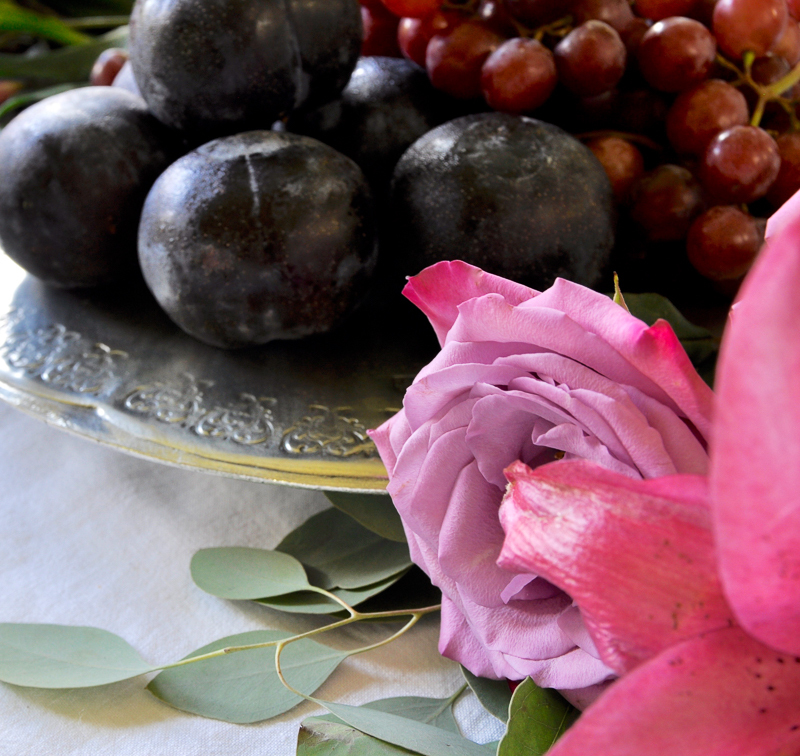 Try choosing fruits and flowers in coordinating colors. I often go to the grocery store open minded and figure it out there based on what they have that looks the freshest and most vibrant. If the strawberries look great, I might build my color scheme starting with red. If peonies are available, chances are, I’m going to have pink in my design. 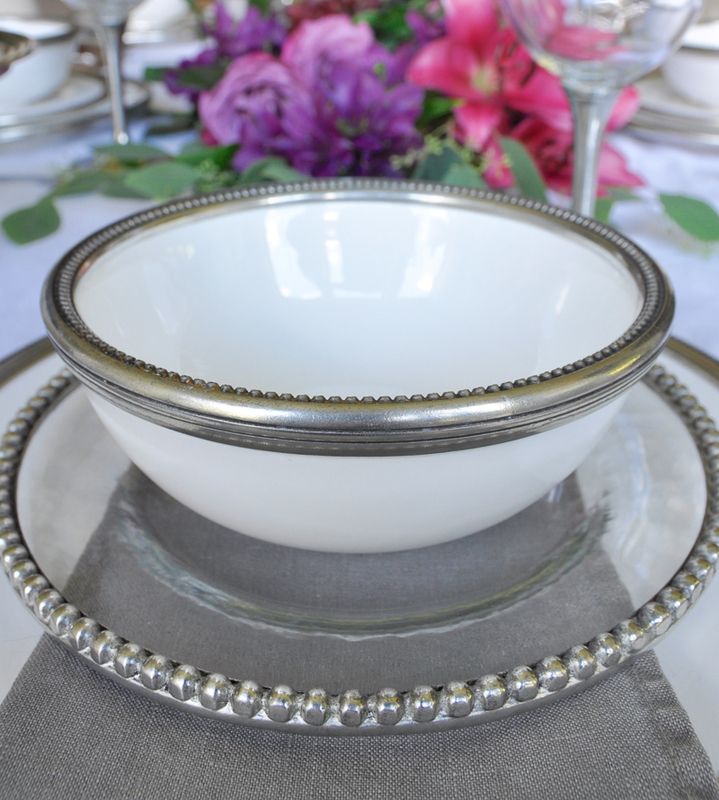 That’s the beauty of white and pewter dishes, I can add any color I want and match any season or holiday! On this day, I found the plums first and started adding purple flowers. 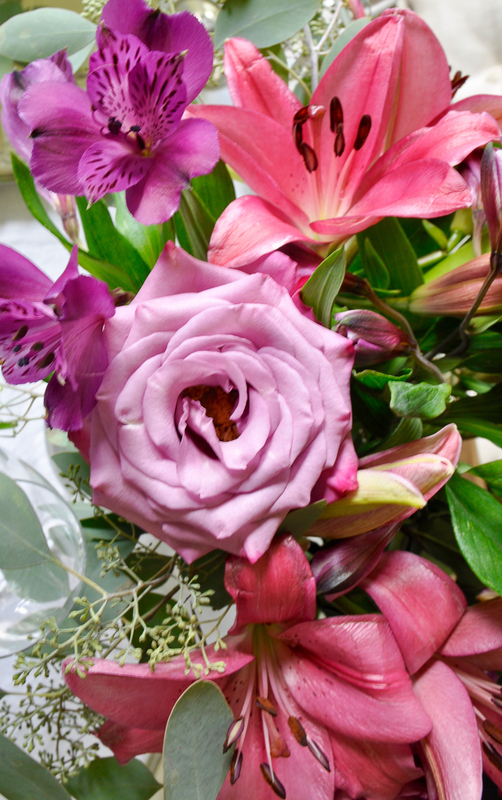 I purchased roses, lilies (which became more pink as they opened up), alstroemerias, and eucalyptus. I also found grapes in the right shades. 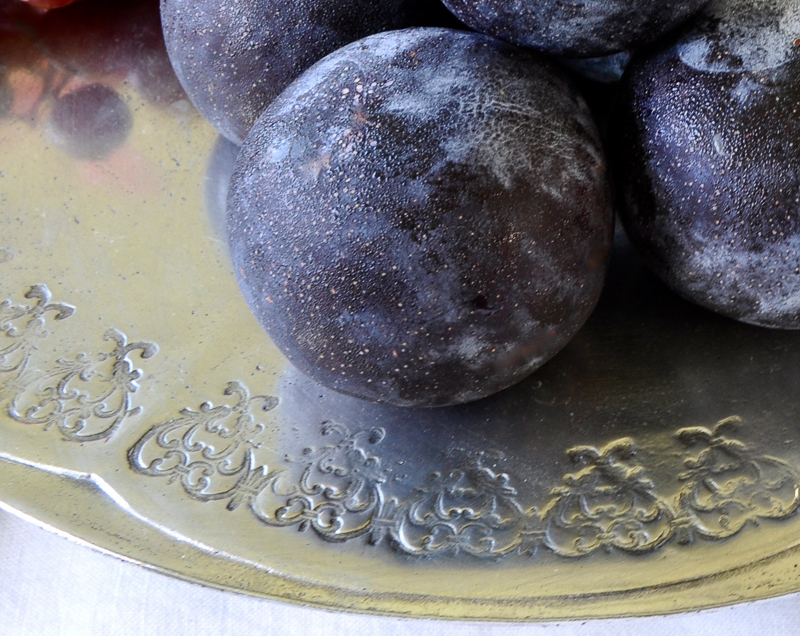 I put a very shallow tray under this gorgeous pewter cake plate to hide the stems and started layering. This is another way to be creative. A cake plate isn’t only for cakes. Here, I’ve piled fruit on top of it, but the possibilities are endless. 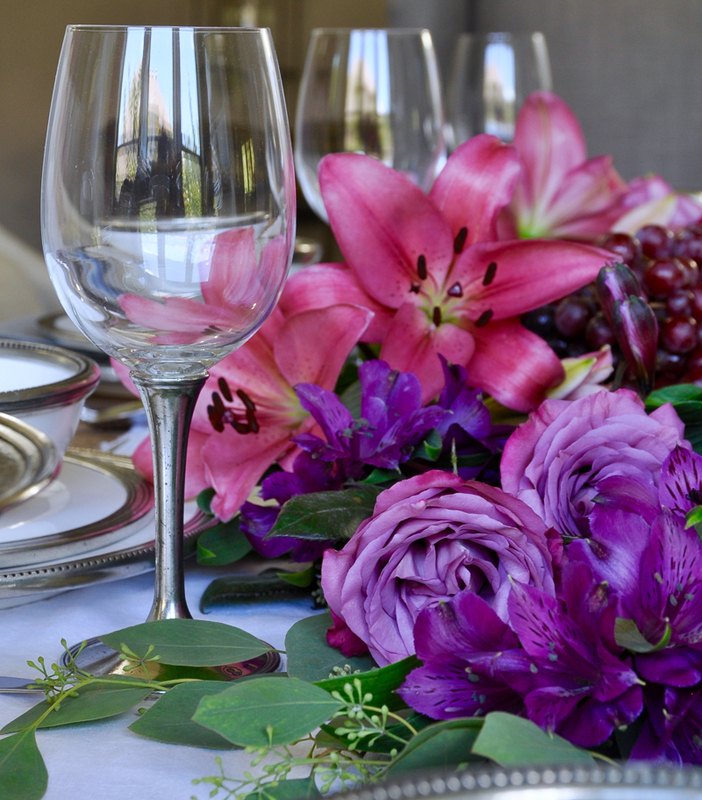 I love this look because it allows the guest to enjoy the flowers during their meal without interfering with their view of each other. I also added another dessert stand with grapes for height. 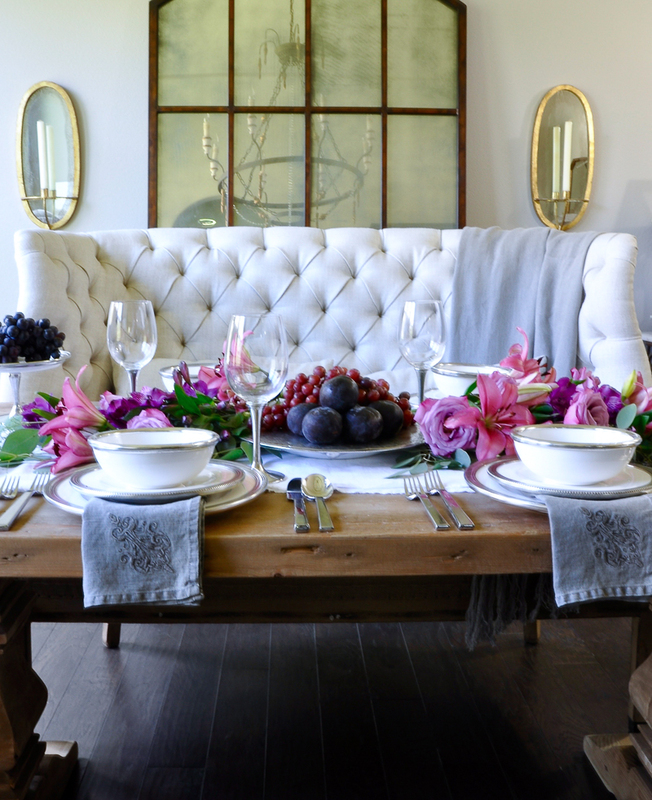 If you follow me on Instagram or read my Tips for Hosting a Perfect Dinner Party, you’ve already seen this piece. I wish you could see it in person. It’s so gorgeous! Serving pieces are added as needed. Again, all mix and match. Look for these in a bridal shower I’m hosting later this summer! I consider these heirloom pieces. I will pass my collection down to my daughter some day and I hope she will add to it and pass it down to her own daughter or daughter in law. If you are ready to start your collection, whether with one piece or more, consider doing it today as Arte Italica is offering FREE SHIPPING on orders over $300 for the U.S.! You will need to use the code, DGSHIPPING on the first page of the cart and the discount will appear at the end of checkout. This promotion is very rare and it only lasts through AUGUST 4th, so don’t wait! I’d love to hear about your favorite pieces, so please leave a comment and consider subscribing to Decor Gold Designs if you would like to receive our weekly newsletter featuring all new blog posts. *This post was written in partnership with Arte Italica, but all opinions are mine. Oh my goodness, Jen! What an incredible table! 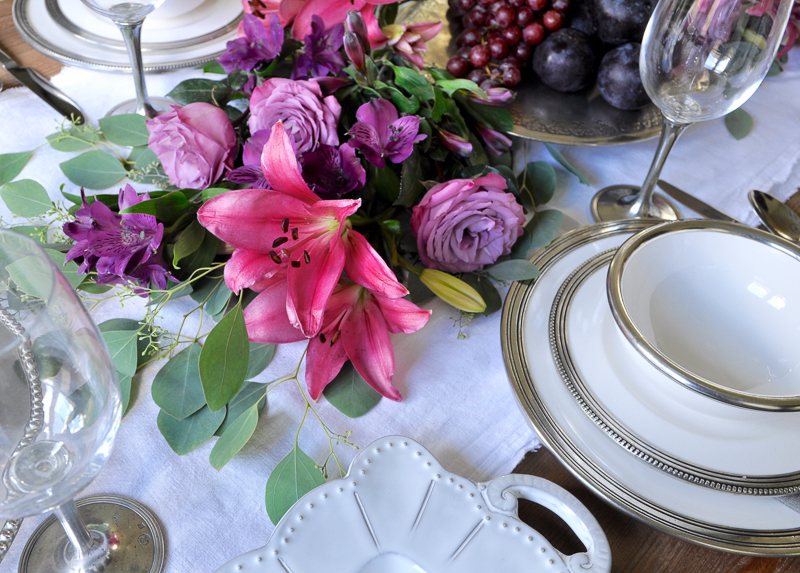 I love those shades of purple and totally agree; my fine china is a mixture between two complimenting patterns and I am so sound in that decision. I don’t know which piece is my fav – I have never seen anything like that Donatello Charger… WOW! I wish I could come be your guest! Jennifer this is stunning and that Donatello Charger is amazing!! I loved how you shared these tips and the one about using your fingers is new to me! I will be using that from now on =). Beautiful setting as always friend! Thank you so much Annie! It is so hard to pick a favorite, but that charger is way up there on the list!!! Thank you Shauna!!! Isn’t that beaded rim to die for? Someone described the beaded rim as looking like jewelry and I couldn’t agree more! The Tesoro collection has it too and I just love it! Oh my goodness Tamara! Thank you!!! I must say, these pieces made it easy to style a fun mix of collections. Can’t wait to add more!!! Thank you so much Brenda! Have a lovely day! Jen!! 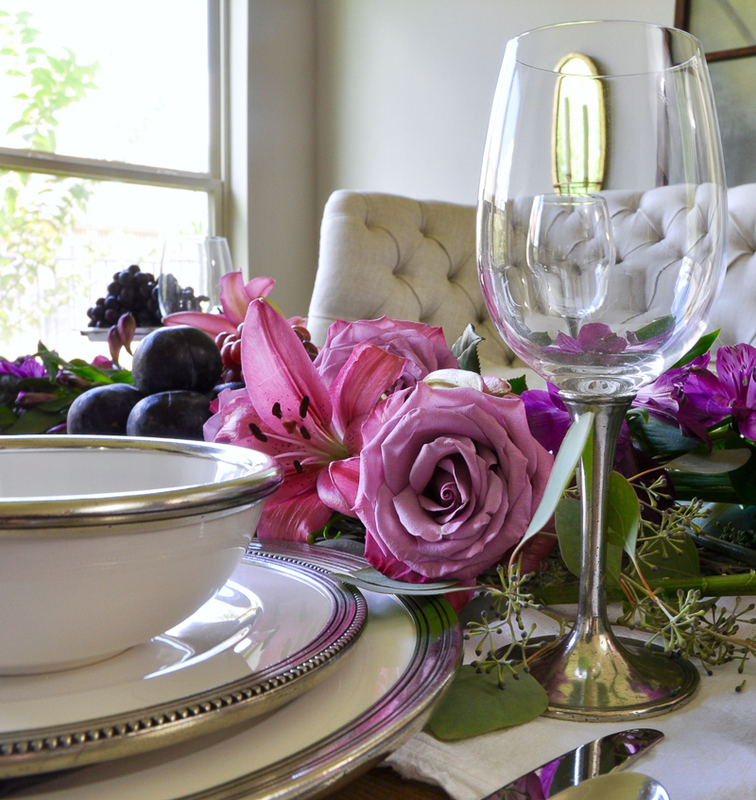 Your table setting is beyond stunning with your new Arte Italics dishes!! I love all of the colors of flowers and eclectic patterns you placed together and would love to be your guest at this gorgeous table! And as always, thank you for sharing your amazing tips with us!!! You are so kind Bree! I would love for you to be a guest here sometime soon!!! One of everything please! 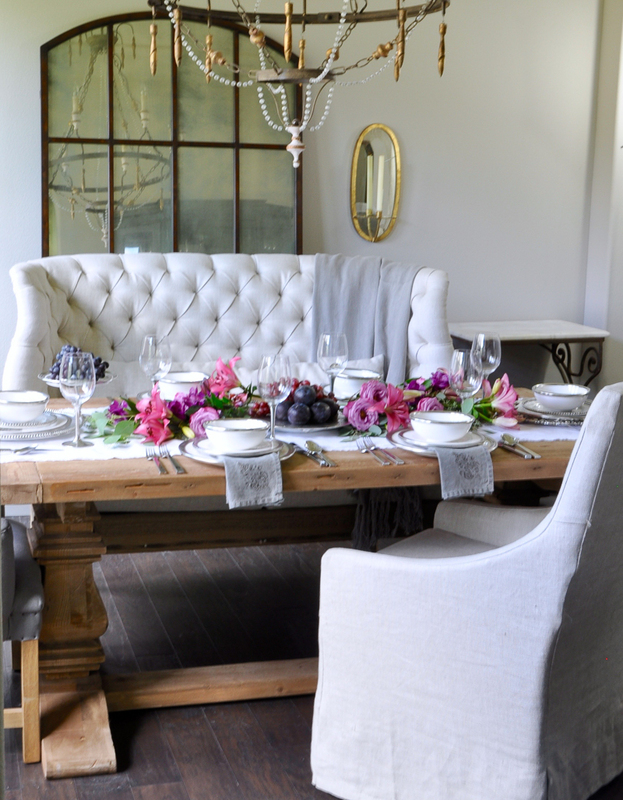 Jen this tablescape is stunning and I love each and every one of the pieces you featured ( those pewter stemmed wine glasses especially!). Glad to have learned of this gorgeous brand! Thank you Kris! You and I love the same things because the pewter stemmed wine glasses are most definitely a new obsession for me! Thanks for stopping by! Your table is simply gorgeous! There is so much detail to look at, and the colours you’ve chosen are so rich and inviting. I wish this company was available to purchase in Australia. Thank you so much for your kind words Jo! Hopefully soon Arte Italica will be available where you are!!! Jen you are amazing! Question. I’m looking into building my collection as well. I have a crystal chandelier that has gold metal. 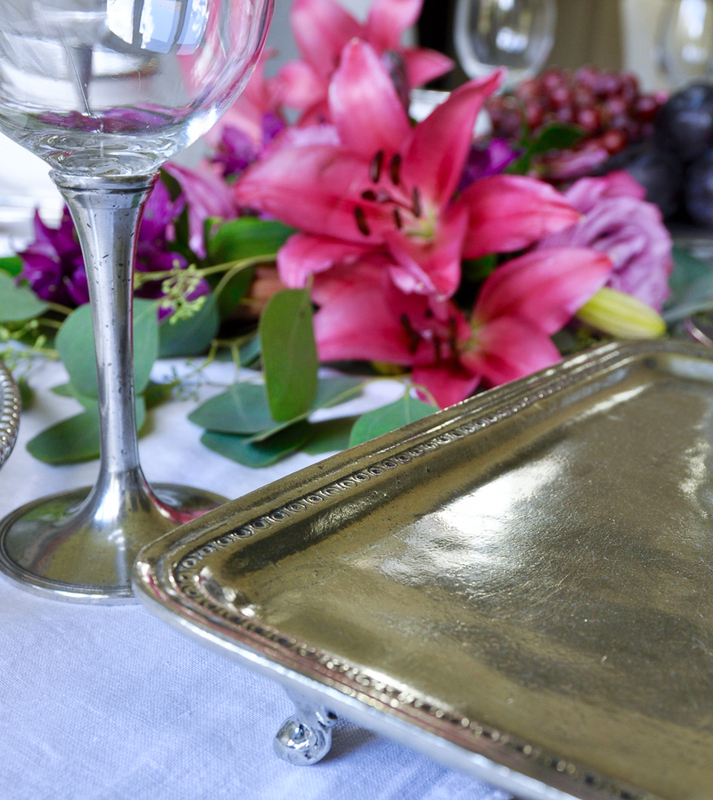 I noticed you also have gold accents in your dining room and used the pewter dishes. 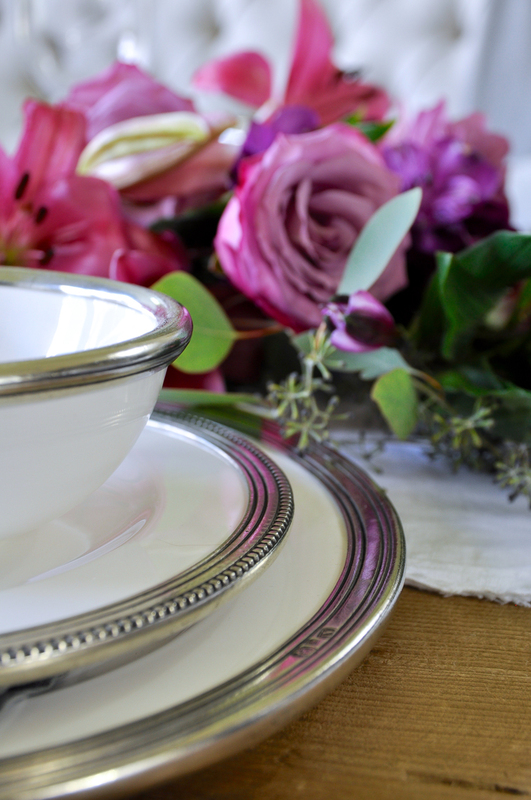 Do you think it really matters what accent colors you have in dishware? I’m in love wit the pewter but I’m nervous it will not go with my gold chandelier. Hi Christine! Thank you so much! Your question is a great one (and perhaps a future blog post)! Gone are the days of keeping metals separate. Designers frequently mix them and I think this look is much more interesting. Truth be told, I plan to add the Orbella flatware when I can and I will definitely mix it in with the pewter rimmed pieces! I hope this helps! What a gorgeous table! 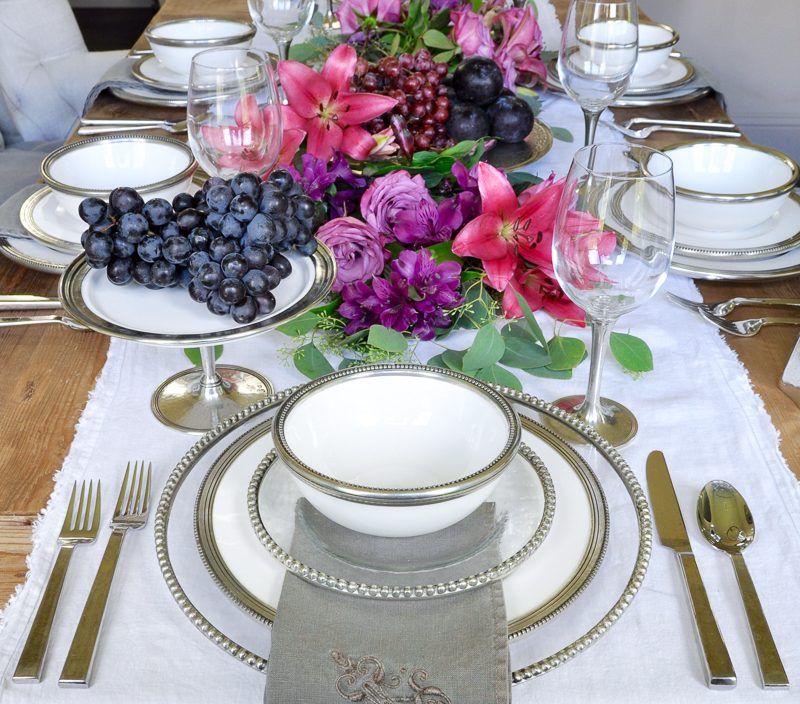 The centerpiece caught my eye first (great tips by the way), but then I saw the white and pewter dinnerware. Beautiful! All of it! And that tufted settee is amazing.